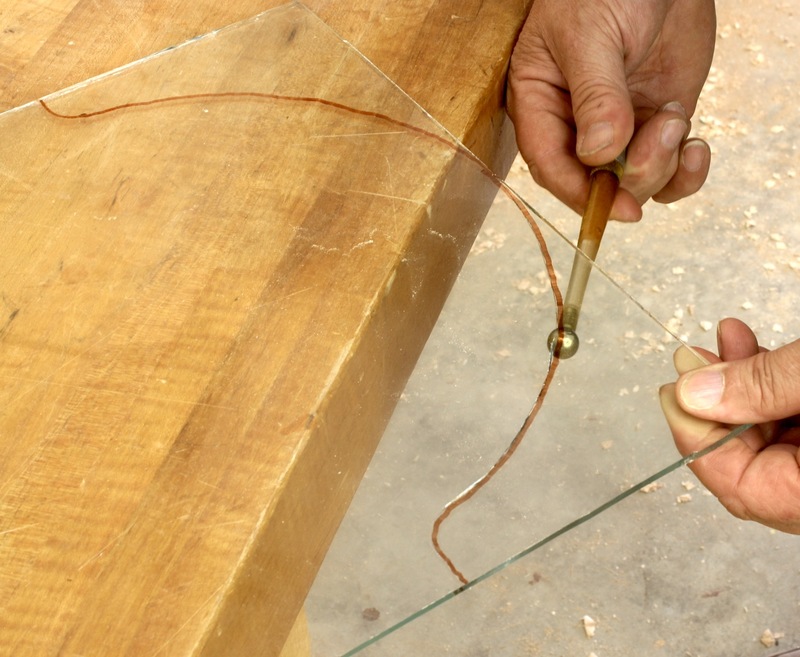 I learned this trick way back when I transformed countless wooden knobs into cupboard turns. 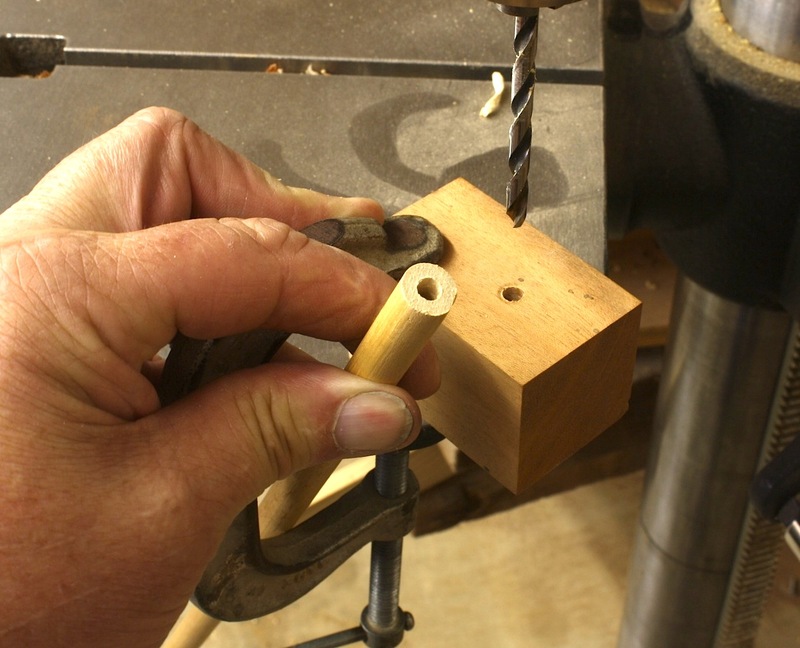 I needed to drill the rounded portion or tenon of the knob – the part that generally was glued into the door or drawer – so I could insert a short section of dowel that would extend through the door. That dowel would have a wooden finger attached that would turn down onto a small wedge attached to the backside of the door. I could have simply purchased the turns, but the knob design seldom matched the other wooden knobs used on the piece. Today, while using more brass than wood for pulls, knobs and turns, I use the technique only sparingly. But it’s a great technique when you need it. Change drill bits to the diameter of you’re new hole, and drill clear through the scrap using the center of the first hole as a guide to align the second hole. The idea is that the first hole holds the piece to be drilled in place and the second hole locates the exact point of the new hole. 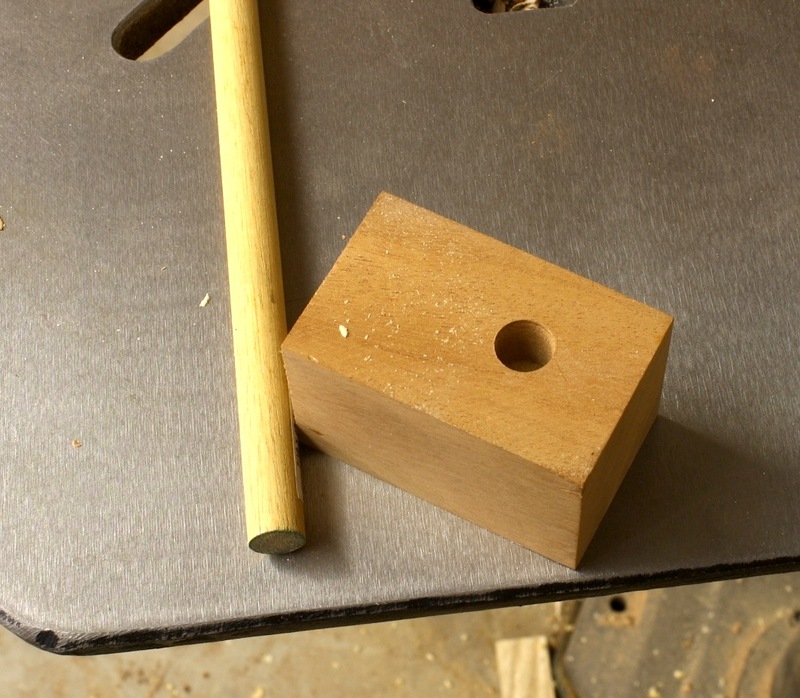 To put this in terms of drilling out for cupboard turns, the knobs would have a 1/2″-diameter tenon into which I would fit a 7/16″-diameter post. There was little room for anything but exact alignment. 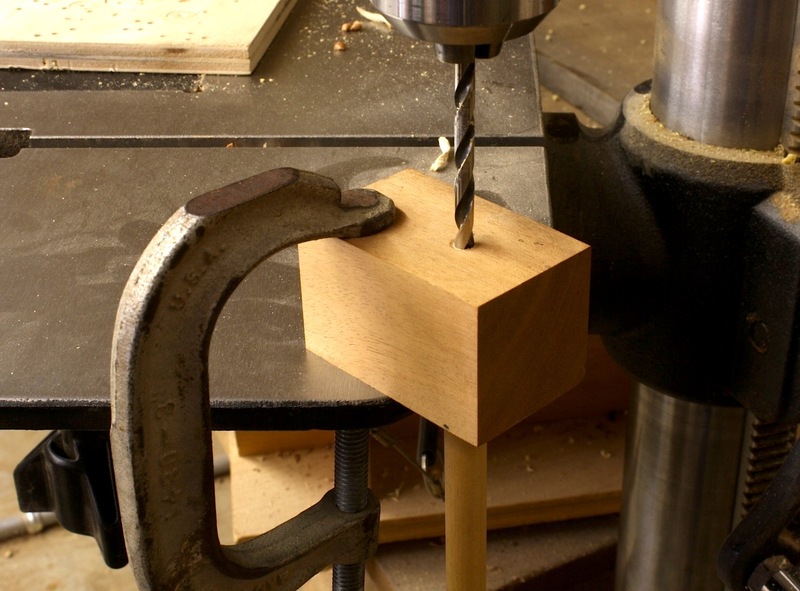 To use the setup, insert the tenon, or short piece of dowel in this case, into the appropriate diameter hole, align the drill bit with the second diameter hole (as shown at the left) and drill down. It’s that simple. 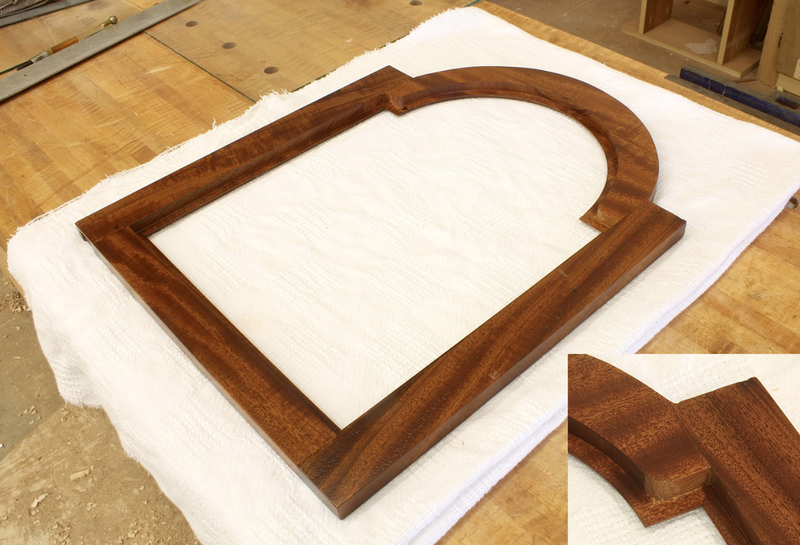 Plus, every time you use the jig, the results are the same (as shown in the opening photo). And it doesn’t matter what diameters you use, as long as the second hole is smaller. Put this trick into your pocket. Some day it will come in handy. A show about stained glass made my dovetails better. Yes, it’s true. I’ve told the story many times, but I don’t recall if I’ve written it in this blog. Here’s the abbreviated version. I was deep into watching a TV show about stained glass. As I watched, I was amazed at how easy stained-glass makers cut and broke the glass they used. 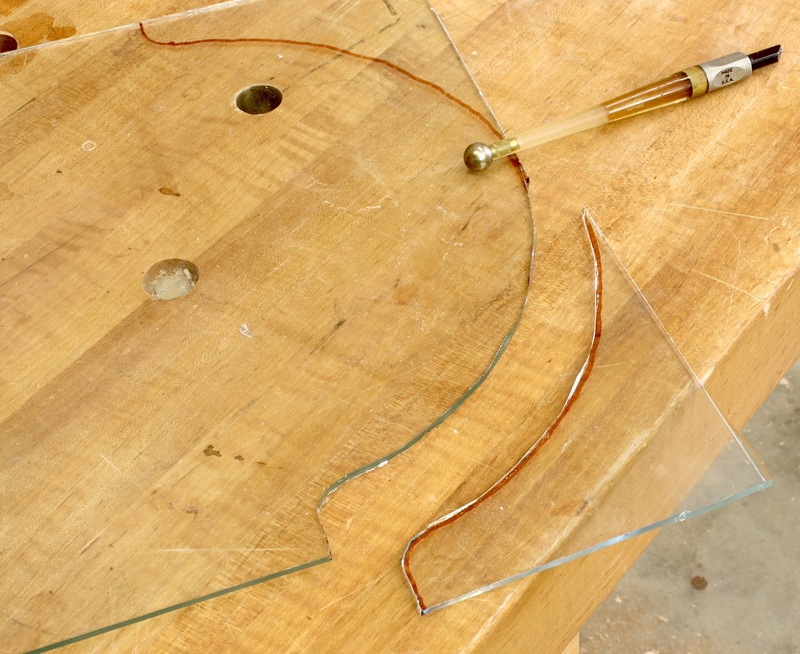 Grab a good-quality glass cutter, etch the outline of what they wanted then snap the piece free right at the line no matter what its shape. They had confidence. 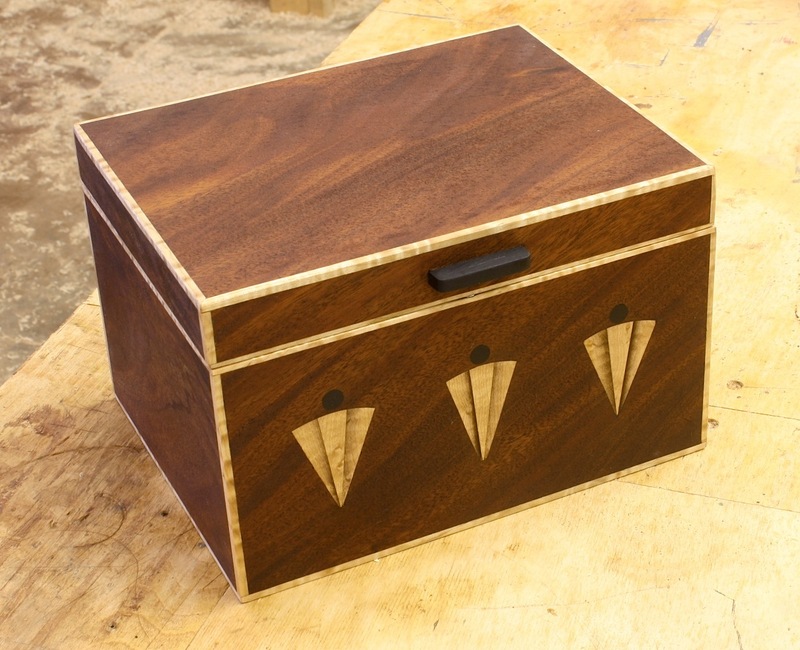 The next day while in my shop facing a stack of 11 drawers for a high chest of drawers ready to dovetail (shown above), I decided that I too should have the confidence to cut dovetails better and quicker; I had to find and use that confidence. That day I completed all 11 drawers and they were the best dovetails that I had ever cut. Confidence is the key. Since that day, I have had confidence in cutting glass as well. I know it’s going to snap at the etched line. That’s what it’s suppose to do. Yesterday, I put my confidence to the test. I cut the glass to fit the tombstone design on the Egerton hood doors. Plus, to make the job even more challenging, I used reproduction glass that has waves and imperfections in the glass. To get the glass cut to fit, I begin with a panel that’s sized to fit the width and is cut to the final length but without the tombstone cut. 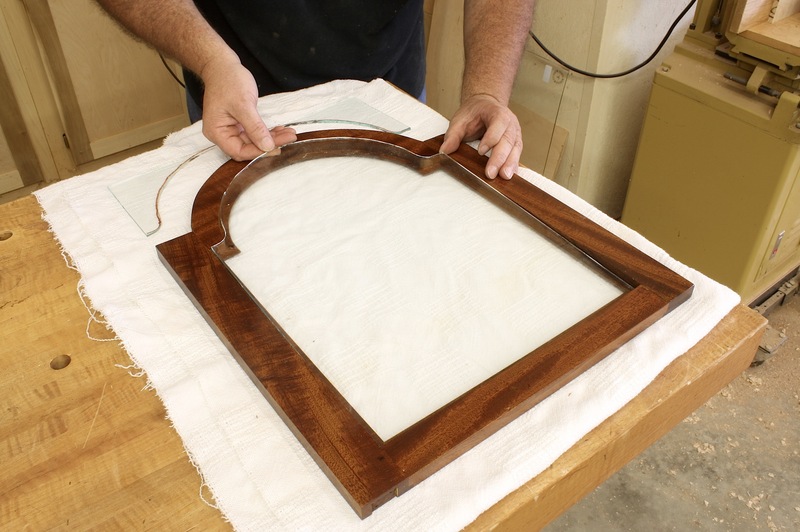 Next, lay the rectangular sheet into the door frame with its bottom edge in the frame and the top section riding just above the arched portion of the door. From there, take a permanent marker and trace the design of the tombstone door onto the piece of glass; complete both halves (the apex of the arch should terminate at the top edge of the cut glass panel. Now it’s time to make the cut. As I score the glass, I listen to make sure the cutter is etching the glass. If you do not hear the etching noise, you’re not going to make this work. With the glass scored, it’s time to put to use that ball shape that’s on the non-business end of the cutter – before I began cutting glass, I wondered what that ball was for. To snap the glass, hold the corner firmly with a slight downward pressure then tap the underside using the ball end. If you watch closely, you can see the etch turn into a break right at the scored line. Be patient, but have confidence. I have two small square pieces of glass that also fit into the hood. After the tombstone cuts, square cuts are a snap. That’s glass-cutting humor. The past two Sundays (the day I regularly post) I was either on my way to the Connecticut Valley School of Woodworking, or on my way to New York city for a day at the Metropolitan Museum. Today I’m sharing photos of the class. In coming posts, I’ll share photos from the Met and from the Connecticut Historical Society – where we first discovered the class project (read more about that here). Class began with a brief discussion of how to pull leg patterns from photos using SketchUp, then the class made patterns and began their legs. After layout, everyone took turns at the band saws so they were immediately plunged into leg work. In expectation of the legs taking two days to wrap up, head schoolmaster Bob Van Dyke arranged a trip to the Connecticut Historical Society (CHS) for Tuesday afternoon. (If you haven’t had the opportunity to visit CHS, do yourself a favor and do so. The staff is first rate and CHS is very reproduction-craftsman friendly.) If you plan to build this lowboy from the article in Popular Woodworking Magazine (February 2014, #209), I suggest that you take an extra 1/8″ off the leg pattern before you begin. 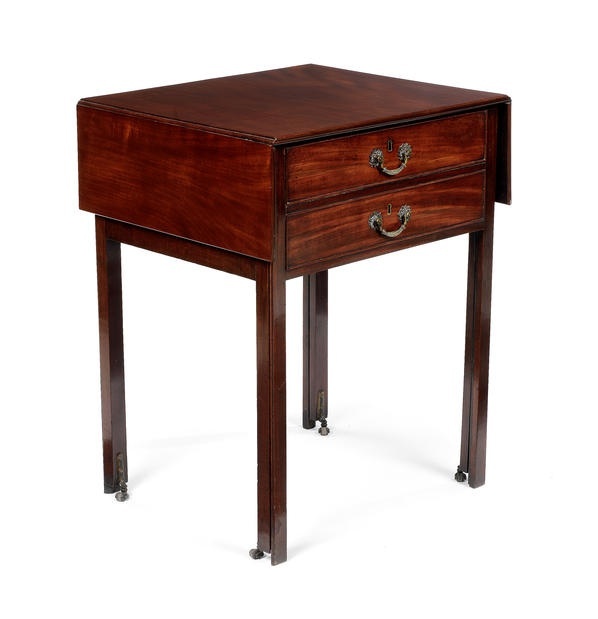 When I saw the original lowboy at CHS for the second time, I realized that the legs on the antique lowboy were much finer, giving it a lightness that I missed while sizing from the many photos I had. After the legs were shaped so far, a trip to the lathe was in order. Turning the feet and pad took a long time for the class – seven class members was 28 individual feet to turn. Everyone survived without problems, Right Jon? 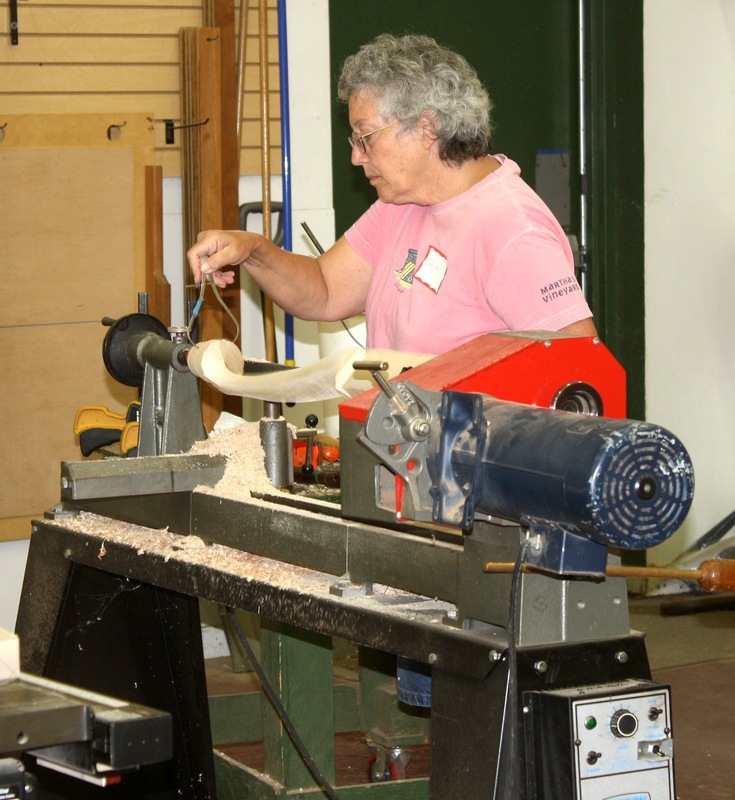 Here you can see Janice using pair of outside calipers to bring the foot to diameter. In all we used two caliper setups and only four or five basic turning tools. And it was nice to have a variable-speed lathe to work on; there’s a lot of wobble when you first turn the leg to shape the foot. From the lathe the next step was to mortise the legs for the aprons, back and ends. While this work can be done while the leg is still as a blank, I think it’s better to actually see what the leg looks like before making a call as to where it will fit. After the legs are shaped, you can easily see which legs look best – those go to the front, while others move to the back. We had two mortisers setup and working, plus I demonstrated how to use a plunge router to do the work. 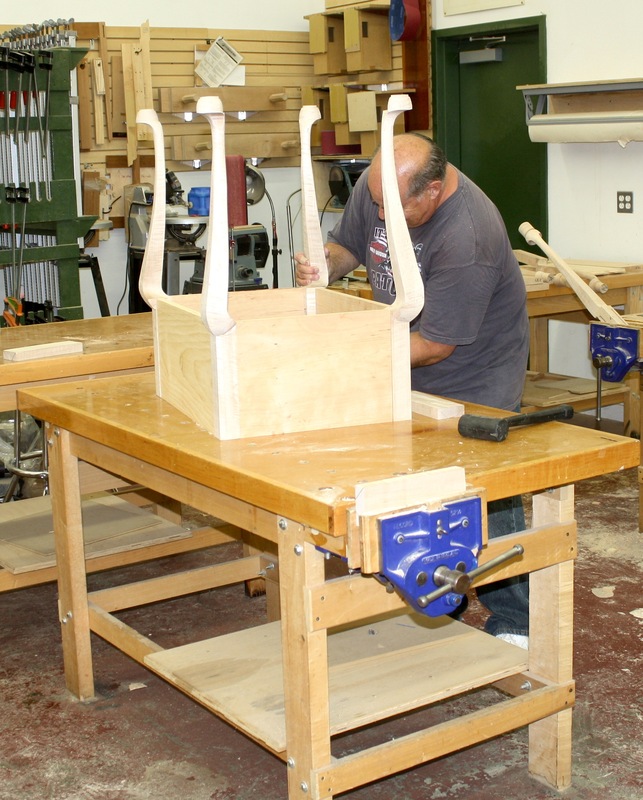 Of the seven taking the class, only one used a plunge router for his mortises. (It’s great during classes to use tools you don’t have in your shop, as long as you know how to do the work when you’re at home.) One additional hint is to make sure that you’re cutting to the necessary depth – a couple of woodworkers had to make a return trip to the mortiser. Sorry I didn’t catch that sooner Mike. Work on the inside of the lowboy went smooth, aside from the occasional misplaced screw pocket. There were a couple of hand-cut dovetail sockets that needed attention, but overall the class breezed through the interiors. As the cases were coming along, the lowboy tops came into focus. A little router work was all that was needed. It took, however, two passes around the top to get the profile complete. And with this project, the profile continued on all four edges; I checked the original lowboy to make sure. Many tops from the period are molded only on three edges. Late of Friday and most of Saturday, drawers were the topic at hand. 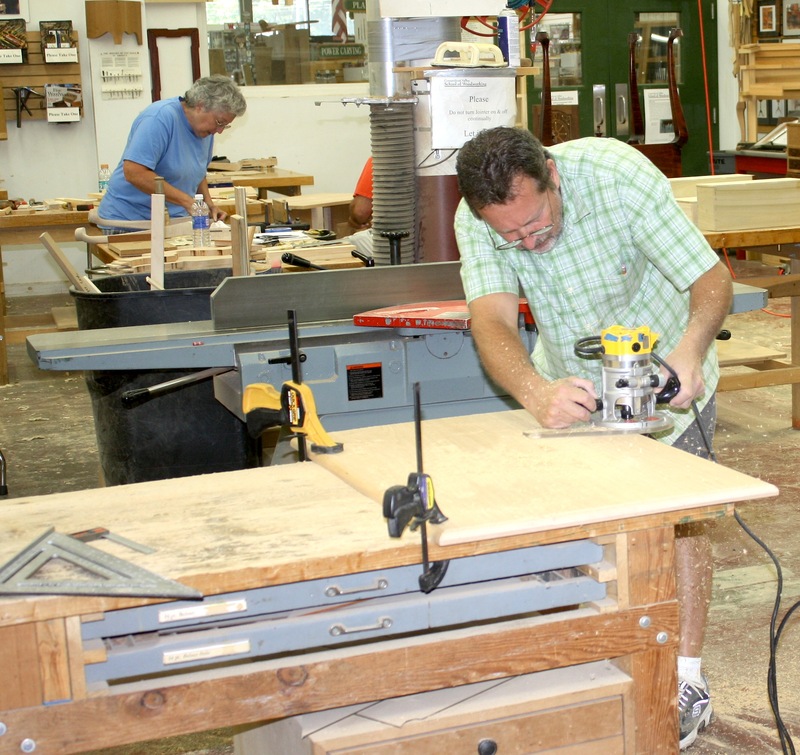 Of the seven in the class, three decided to build the drawers with the slanted sides and back – a challenging task even if you’re experienced in dovetail work. 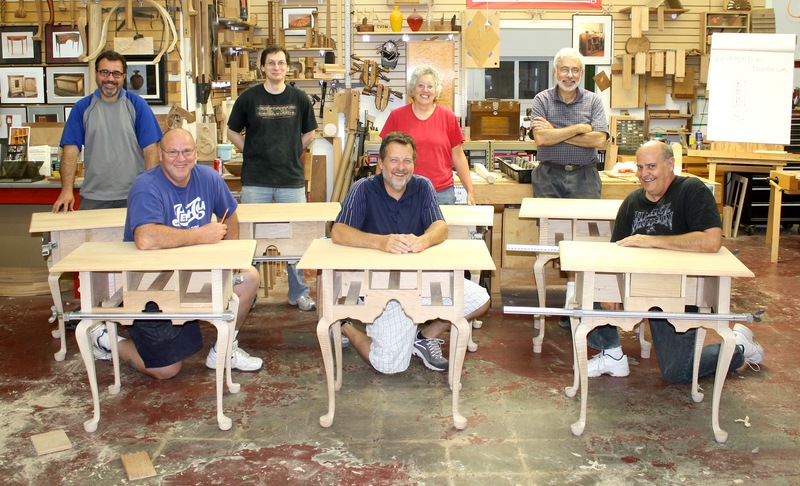 As you may have guessed from the opening photo, not all the drawers were completed during the class. As it is with many classes, there is homework. Also, most of the class members decided not to glue up their lowboys. Flat-packing the pieces home is much easier than trying to cram a lowboy into the back seat. The class went great. I worked with a lot of talented woodworkers. I’m amazed at how good many of the folks are who take classes. 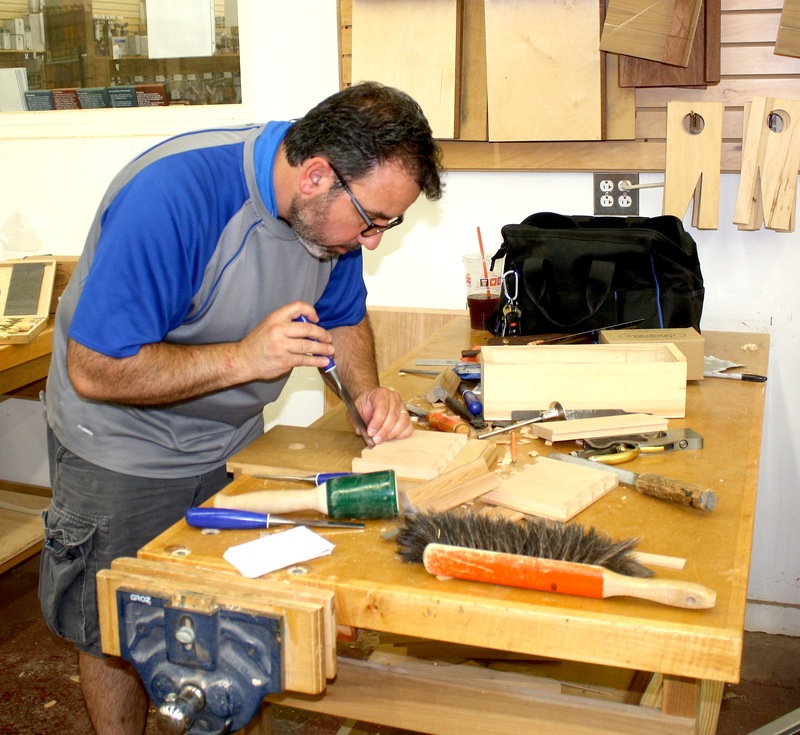 If they had more time in the shop, their work could easily rival many of the top woodworkers in the country. Take a class. 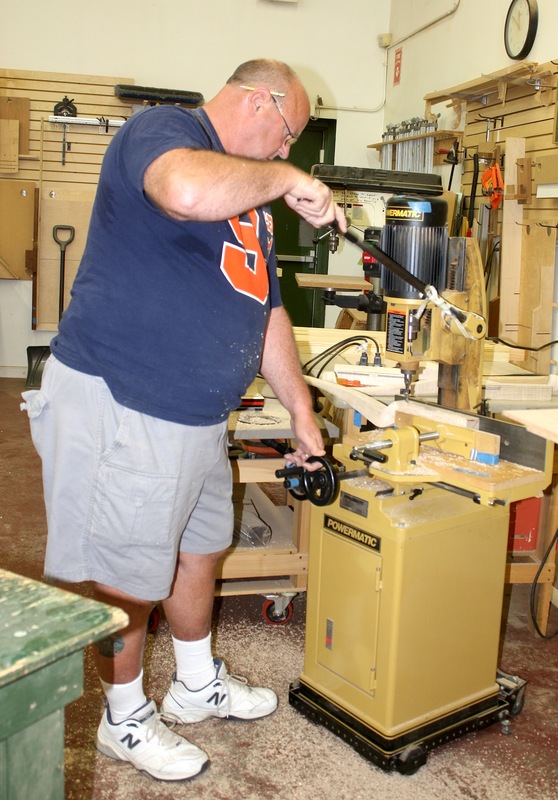 It’s fun and it’s sure to improve your woodworking. When I got up on Saturday morning, I knew there was a huge possibility that in the shop I wouldn’t be doing what I planned. I was going in to spray the final coat of shellac onto my clocks; I’m looking to darken the overall appearance just a shade more. The humidity was high which means that there was a chance for the finish to blush, or turn cottony white with moisture trapped in the finish. Instead, I decided to work on the backboards for the two clocks. 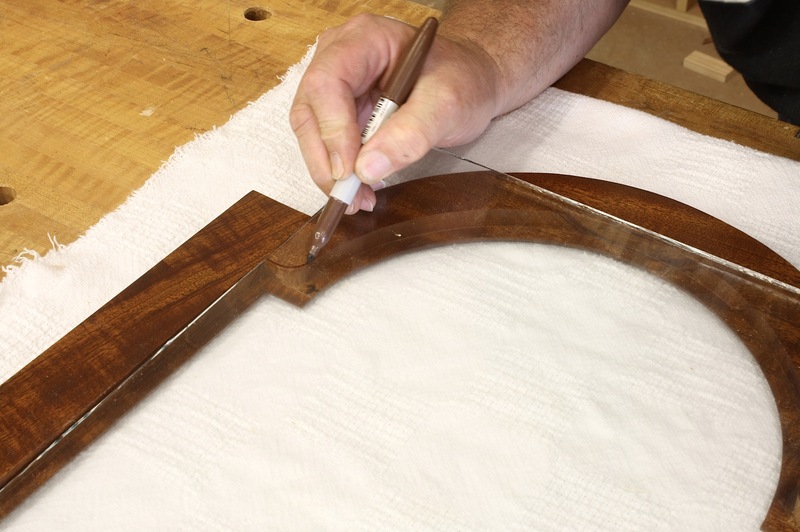 On most antique clocks, the backs run top to bottom and are not attached to the hoods, so the hood can be removed. The stacked series of three photos at the left show a typical clock back (click on the image to make it bigger). Generally you see a main board that runs the full length with ears attached at the base and hood areas. That requires a board or panel that’s 90″ in length and 15″ wide. I could have done that – may due it if John and Joe (brothers for which I’m building this clock) want to go with the antique design. The second clock, however, is for me (at least at this time), so I’m going at it differently. I’m running the boards across the back from the bottom up about 50″ just as would be seen on a case piece of furniture. I then plan to turn the upper board so its grain runs vertical. To make the transition, I’m using a tongue-and-groove joint. It’s a bit more work and will need a few additional fasteners (nails I suspect), but I can use short pieces of scrap cut off from other projects. Frugal, huh! To make this happen, I first added a shiplap cut to each of the milled, over-long, random-width boards selected for the back. I began at the bottom – the bottom board was cut on only one edge. From there to the 50″ mark (it doesn’t have to be that length, it’s just what I chose based on the number of pieces I had to use and the width of those pieces), I fit and positioned each board. 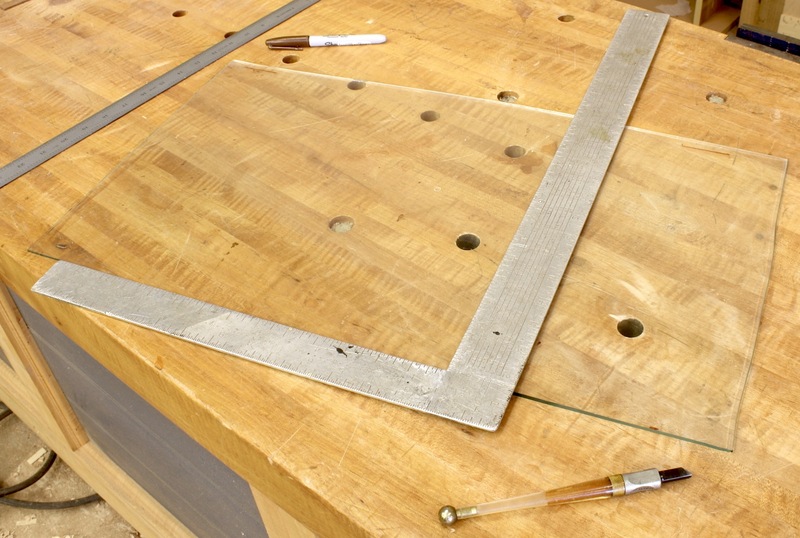 The top board – also shiplapped on one edge – was taken back to the tablesaw for the tongue portion of the transition joint. I then slipped the top horizontal board in place and added a couple of clamps to hold things secure. I had to get the final length measurement of the vertical board, so I had to stand the case upright and add the hood. With that measurement in hand, I cut the groove portion along the bottom edge of the panel, and laid out the exact spot where the back needed to step out to fill in the extra width of the hood. Because the glued-up panel had set in the shop for some time,there was a small amount of warp I had to deal with. Here’s a great shop tip: To straighten out the panel, I clamped a straight piece of stock across the panel width keeping the clamps above the height of my saw fence, then made the cuts needed to form the groove. The ears were cut at my band saw, then trimmed to length at the bench using my handsaw. To final check and tweak the fit, I joined the tongue and groove, then slide the assembly into position. Below you can see how the transition works. Because the top panel extends down the clock’s case, there are more than enough places for fasteners. This setup should work great. 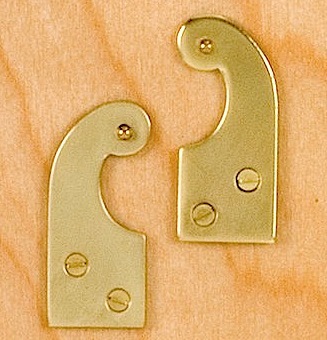 When you think about hinges for furniture, you probably think about regular hinges with two leaves that are screwed to a door and to the case or face frame. That’s not the case with many hood doors on tall case clocks. The opening photo shows two pairs of hood-door hinges. No knuckles. Just a flat piece of brass cutout in a funny shape. These hinges are different. If you look at the photo above, you get an idea as to what the problem is with the hinges. The company sends out hinges that are all the same. Unfortunately, you need matched pairs. Also, the holes in the hinges are too small for appropriate screws. The first order of business for me was to align the hinge plates into pairs, enlarge the holes and make countersinks for the heads. (I marked the face that needed the countersinks.) 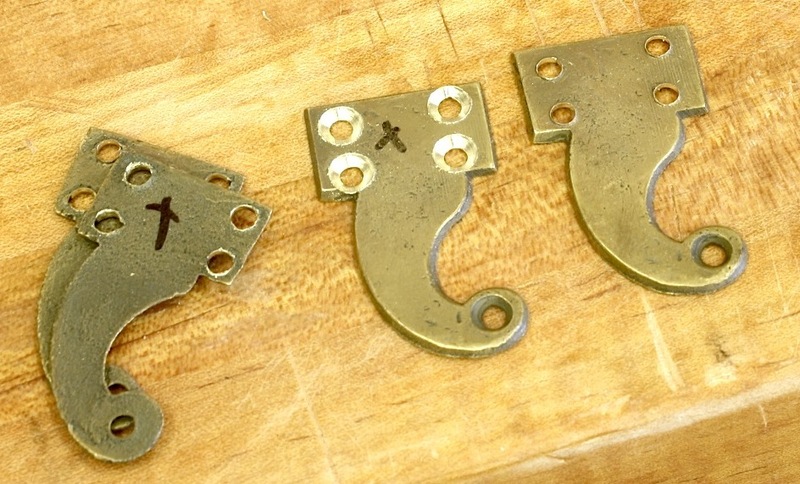 The work is easy because the brass is soft, but due to the odd hole locations presented with the antique look, the enlarged holes get dangerously close to the outer edges of the hinge. If I could get these hinges without holes and countersinks, I think I’d be better off. In fact, if I had the time (and inclination to do so), I may try cutting my own from a piece of sheet brass. How these hinges fit is also different. 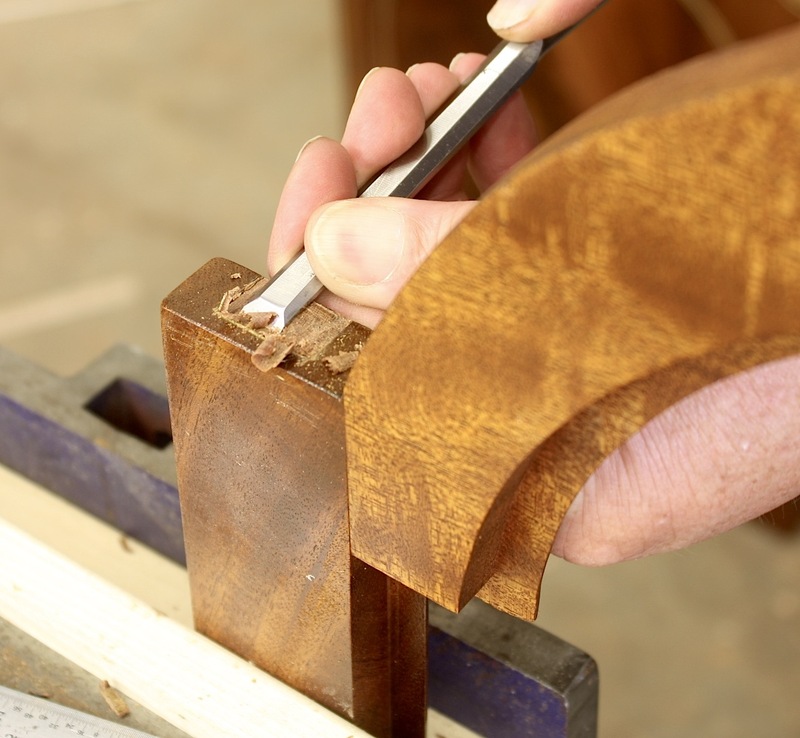 The work to set the hinge is all in end grain – the top and bottom end of the hood-door stile. As you locate the hinge, you need to watch the edge of the door stile. A strong rap with your mallet and the chisel can easily break the grain along the edge of the door. That’s not good or fun, so work with a knife or cutting gauge and leave the whacks for dovetails. And you better sharpen your chisels before you begin. Of course, you know what it’s like to pare across end-grain. 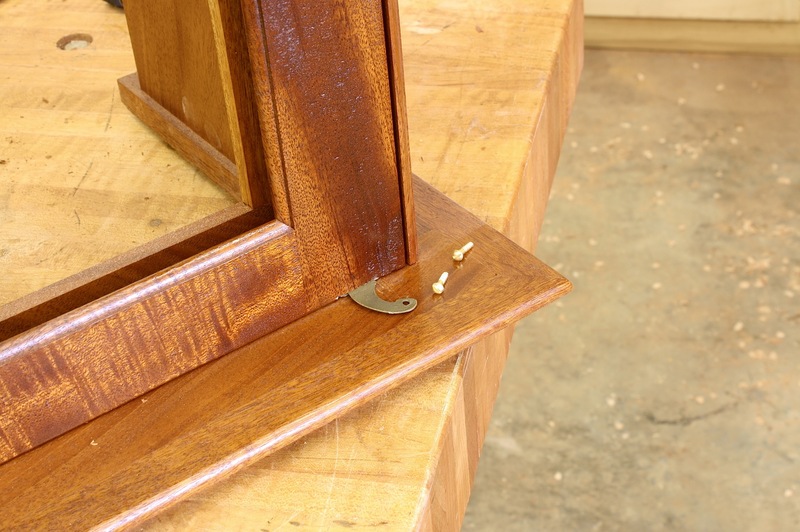 After you get the hinges set into the door stile – one at the top and a second at the bottom – the screws are installed. Because I’m merely fitting these at this time (I have more finish work to do), I installed only two screws per hinge. A bird-cage awl is the perfect tool to start these screws. Here you can see where having the holes too close to the edge of the hinge can be problematic. In early builds, I’ve split the stile as I’ve driven home the screws. Make sure you properly drill the holes, especially at the outer edge. With the hinges installed, how things work is rather simple. The part of the hinge that extends out from the door is secured to the hood with a screw through the hole. Originally, that was probably done with pins, but I think a screw is a better choice in case you need to pull the door for any reason, such as to replace the glass. This method also allows you to align the door in the opening. Set the door at the bottom then as you install the top screw you can make slight adjustments to get the reveal just right. 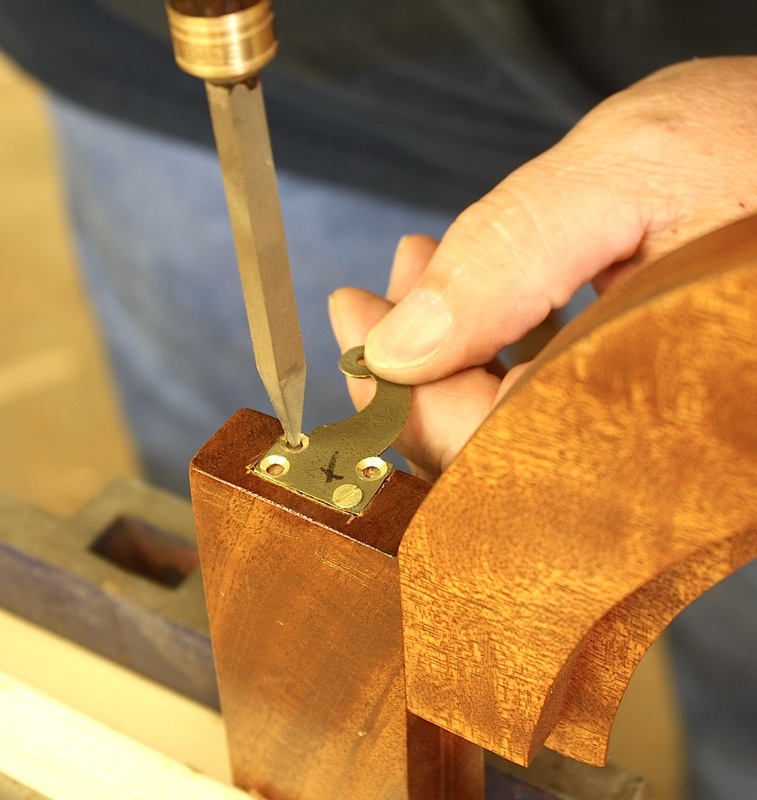 And here’s a tip when working with hardware that shows more handwork. 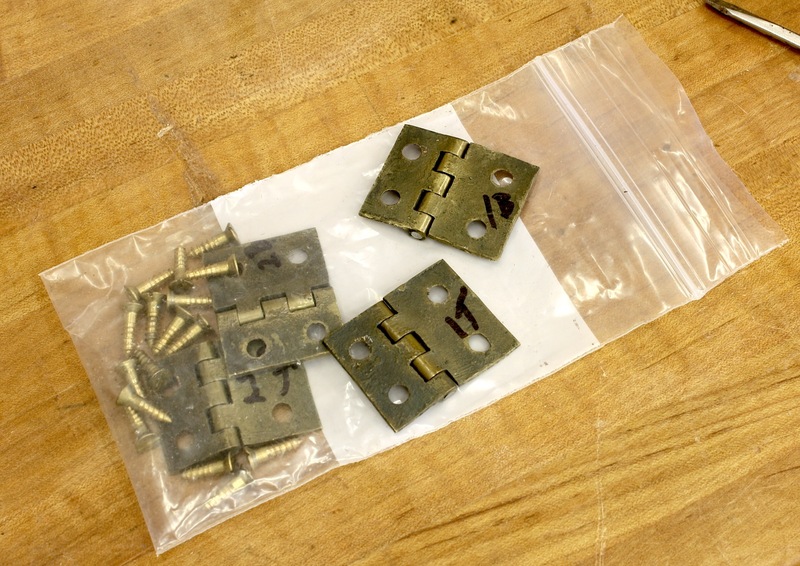 Mark the individual hinges so you can get them back in the same place. I learned this lesson the hard way when I built my first step-back cupboard using rat-tail hinges. As I we back to re-install the hardware, I spent too many extra hours trying to fit the parts into the proper position – all leaves are not the same, and the screw holes are not matched. Sharpie to the rescue. I’m sure you’ve heard the saying “never send a boy to do a man’s job.” That holds true for magnets, too. After hinges were added to the inlaid box, I drilled and installed two rare-earth magnets to hold the lid closed. Working in only 1/2″-thick material, I decided to use smaller-diameter magnets. After drilling the first hole and wanting the two magnets to line up, I used a 23-gauge pin as a center finder to mark the lid location for the second magnet – it worked like a charm. I epoxied the magnets in place and went home for the day. The next day, I dropped by the shop on my way to work just to check my magnetic lid setup. The magnets looked great. They were perfectly aligned. There was not enough pull, however, to hold the lid closed. Crap! Now I’d have to pull those magnets, repair the box and lid from the destruction of pulling the magnets and come up with another option to hold the damn lid closed. I thought about it for a couple days then decided to stay with the magnets, but increase the size. Go big or go home, I guess. With the repairs made and the two magnets holding strong, I was ready to apply a finish, so I mixed up a little oil/varnish finish for the box. 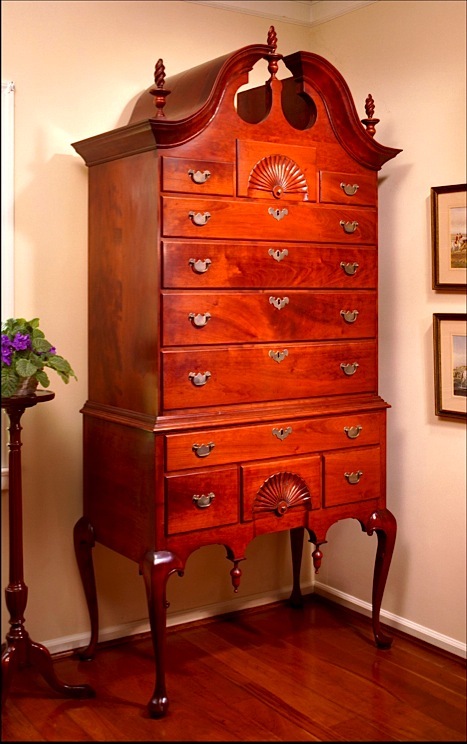 I’ve used this finish on many pieces of furniture, including a Shaker sewing desk and a Seymour marble-top sideboard. It’s easy to make and easier to use. Mix 1/3 boiled linseed oil, 1/3 spar varnish (spar adds a bit of elasticity to the finish) and 1/3 turpentine (I’m told you can use mineral spirits as well, but I’ve never done so). That’s it. For larger jobs, I mix enough for 1-1/2 coats, then eliminate the turpentine (50/50 varnish and oil) as I add to the mixture. 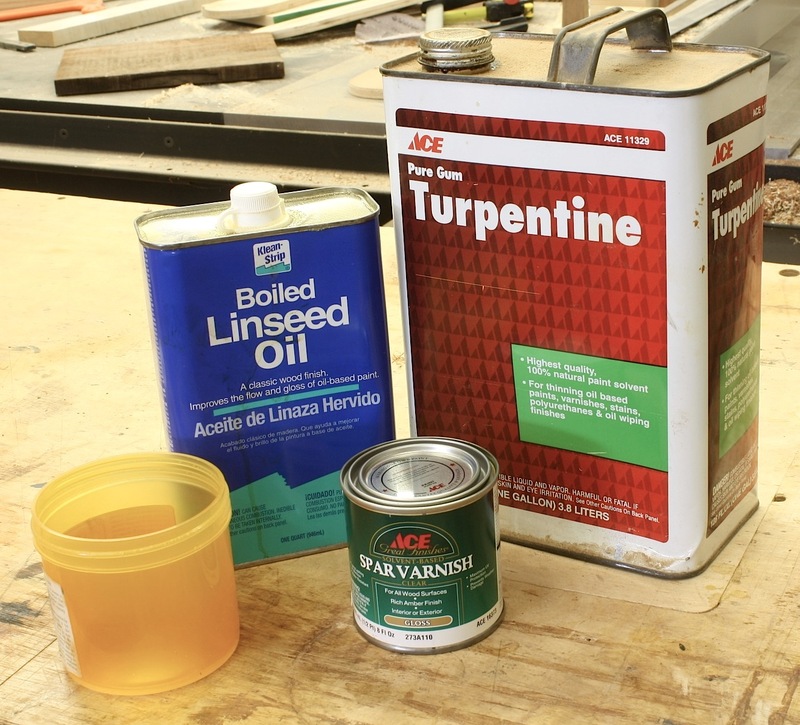 The turpentine simply thins the mixture so it can soak into the grain; you only need this on the first coat. Brush the mixture onto the project and keep everything wet for about 5 minutes so the finish gets deep inside the wood pores. After five minutes, wipe away the excess. If there’s no excess, you didn’t apply enough finish. Let the project sit until the finish is dry, then apply another coat. On later coats, because the finish is only oil and varnish, you need to let things sit until the mixture feels like honey before wiping off excess. And if you missed a spot when wiping things clean or if you have a rough texture in the dried finish, take #320-grit sandpaper and sand the surface smooth. The opening photo shows the box with its first finish coat applied. It takes three coats to build a protective finish, four coats starts to build a sheen and with each additional coat, the surface becomes even more shiny. Like I said, easy. I’ve always been fascinated with furniture that expands to become something totally different much like the transformers that appear as cars or trucks then become huge robots. I look at these transformers as I do pieces with secret drawers and compartments – it’s a surprise. During a recent trip through a couple of auction catalogs, I noted a few examples that I thought I’d share. 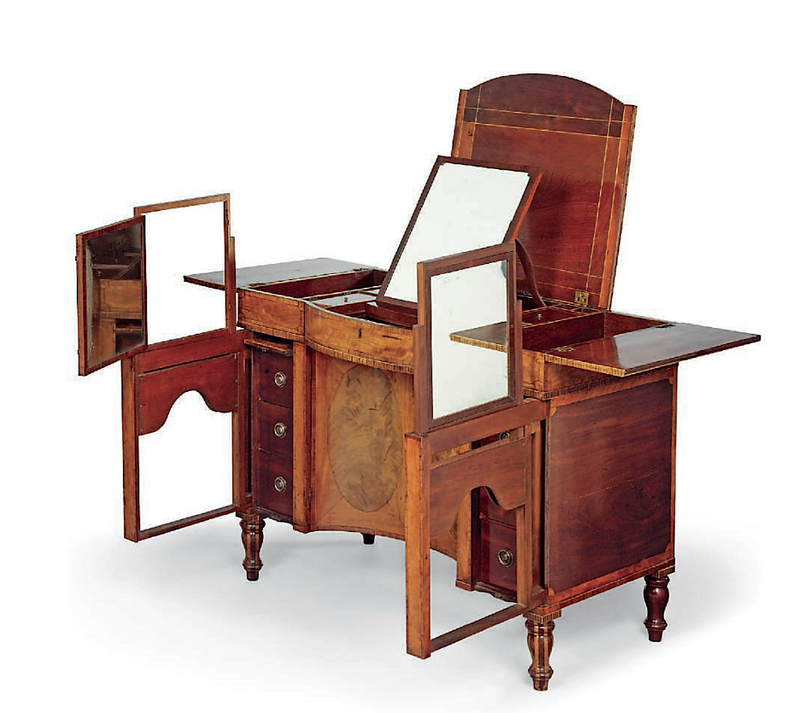 Interestingly, these auctions were and are in London and are of English antiques, This makes me wonder if woodworkers in the United States back in the day were not as creative as European woodworkers, or just didn’t have the customers for or the time to build these hidden gems. You can, of course, find examples strewn around the country, but the largest number of these pieces seem to come from the Old World. The first example is not as strong of a transformer than the two pieces coming later. 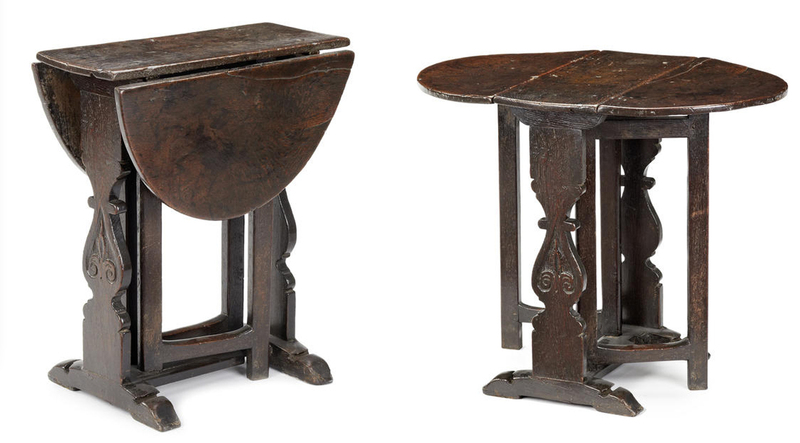 It’s an English Gate-leg table. The leaves flip up and two not-so-hidden swing legs pull out to support the leaves. I like this design because when not in use, the table sits compactly out of the way, yet it is not easily tipped over do to its significant base. Next up is a smallish two-drawer stand that when looked at, you know there is something about it. You obviously see the added leg fronts. And the drop-leaves let you know that the tabletop grows in size. The question then becomes: What else is in the cards for this stand. This is where it gets interesting. 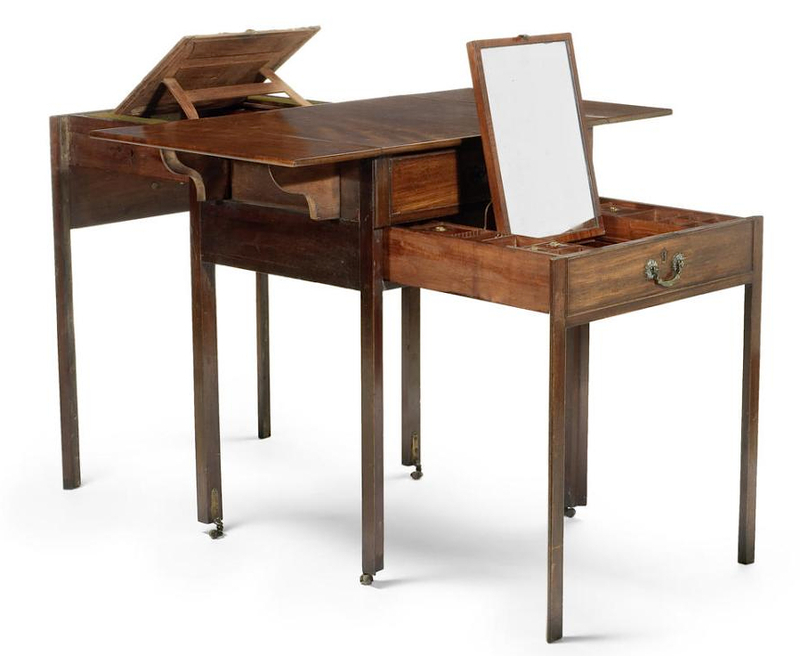 Would you expect that this stand transforms into a writing and dressing table? Check it out. I often get asked if it’s OK to glue up feet and legs. My standard reply, which I might need to rethink, is no because you’ll see the glue lines. If, however, you assemble alternating wood species as shown here, you can make it work – at least Mr. Sheraton did. If you have examples of furniture that transforms, add a link in the comments section. Let’s see what we can find.